Think your iPhone vs Android debates with friends are fierce? Two Oklahoma roommates took a literal stab at making all of our smartphone arguments seem rather tame overnight. 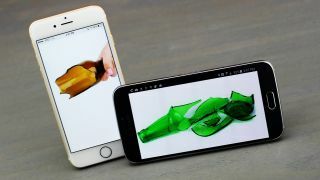 Trolling each about the iPhone 6 and new Samsung Galaxy S6, the pair's late night exchange escalated when they decided to break beer bottles and stab each other. "Police believe alcohol played a big role in this fight," said local television station KTUL in the most obvious statement ever. One man is said to have smashed a bottle over the back of the other's head and both were hospitalized. Neither the men, nor their mobile operating system preference, was identified. There was no clear winner in the iPhone vs Android argument, or an obvious aggressor, as the police are more interested in. Also, no Windows phone roommate was harmed in this altercation, likely because there wasn't one. Just another reason to know your roommate's smartphone of choice before signing that lease and moving into an apartment.